Could this possibly be satisfying? What if you were able to be tricked into thinking you're eating delicious things, when you're actually just eating a gelatinous slice of futuristic goo? 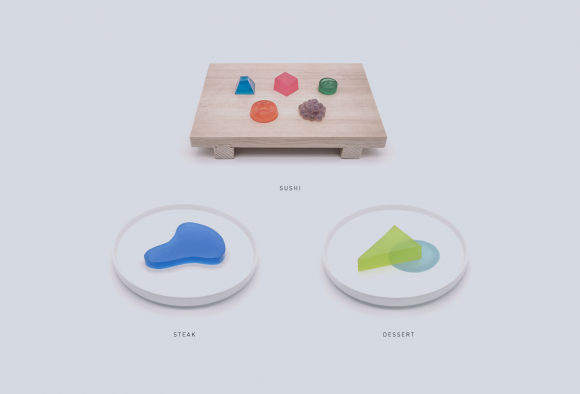 Kokiri Lab, a company founded by experience designer and researcher Jinsoo An, recently launched Project Nourished, a tech startup that aims to do just that. "By isolating various flavor compounds and recreating their taste and textural profiles, coupled with aromatic and virtual reality diffusion -- we can mimic a surprisingly broad spectrum of foods," reads the website. The setup has lots of moving parts. You wear the virtual reality headset, which covers your visual sense. There's a special fork you have to use, as its movement will be tracked by a motion sensor, so that when you move the fork up and down, you'll see, in the headset, a virtual fork moving up and down in the same way. There are little cubes with [sic] emit aromas. And the food itself is created from low-calorie materials like agar agar, pectin, and gum arabic, which are natural thickeners (agar agar [sic] found in algae, for example) that turn liquids into solids, sort of like gelatin but more so. "What makes this so unique is that the experience merges physical and virtual environments into one, which means you can still chew, feel, smell and taste, but without taking in calories," An said in an interview with the Telegraph. "We think this experience could be used to allow people with obesity, diabetes or any dietary restrictions to eat anything they desire without the negative consequences."